Hello everyone! Alicia here again from Sew What Alicia. This month I have a really fun project to share with you! If you are like me then your kids leave your car in a constant state of turmoil! My car is literally always a mess! This week I took the kids to the craft store and let them pick some fabric so that I could take my car back! 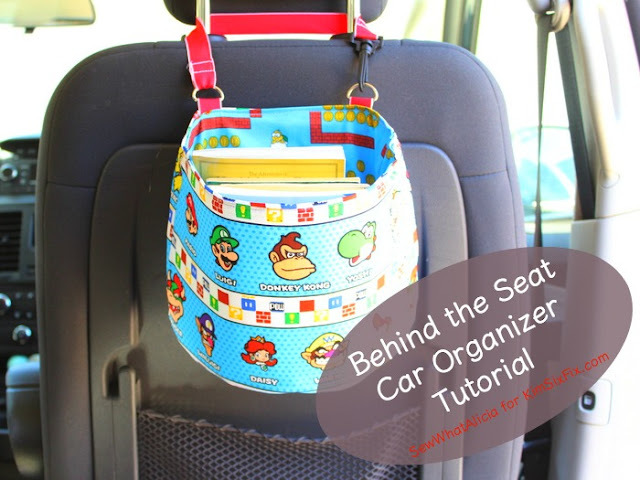 Here are some car behind the seat organizers that will help you clear the clutter and tame the turmoil of your car!! 1/2 yard of 2 coordinating fabrics. 1/2 yard of heavy duty interfacing. We will start with the heavy duty interfacing. Use your cutting mat or a tape measure to draw a 10" line on the bottom edge of the interfacing. Then at the 5" middle measure 5" up and make a mark. Draw a curved line from one edge to the mark that you just created. Cut along the two lines you just made. Then fold the edge over and use it as a guide to cut the other half of the semi circle out. This method will ensure that the two sides of the semi circle are even. You might have a little point if you aren't great at drawing circles (me, I am not good at drawing circles!) so just trim it while it is folded in half to smooth the half circle out. Now take the half circle and line it up on your fabric. Trace 1/4" around the entire half circle and cut the fabric out. Do this with both the main fabric and the coordinating fabric. You will end up with 1 half circle in the interfacing and 2 half circles of fabric. Now top-stitch the interfacing to one of the fabric half circles. This isn't absolutely mandatory but it makes working with the interfacing much easier so I definitely recommend it! Now grab your fabric again. From each piece you are going to cut a piece that measures 9" by 14" and a piece that measures 9" by 10". In other words you need two 9x14" pieces and two 9x10" pieces. Before we work with the fabric we will use it to measure out two more pieces of interfacing. The interfacing should be about 1/4" less than the fabric around all sides. You will trim it more towards the end so it doesn't have to be perfect you just need the rough size. You only need one piece of interfacing of each size. We will work with the 9x14" pieces first. Along the long 14" bottom edge we are going to notch the fabric to allow it to curve. Now line up the notched edge with the curved edge of one of the half circles. Right sides should be facing each other. You can see in the picture below that I sewed about 1" in from the edge of the circle. When you pin the piece in place if there are wrinkles you will use a bit more or less of a seam allowance to make up for the fabric length. Just trim the excess off 1/4" away from the sewing. Do this step with both of the half circles and the 9x14" pieces. The next step is a touch tricky but take it slow and pin like crazy! 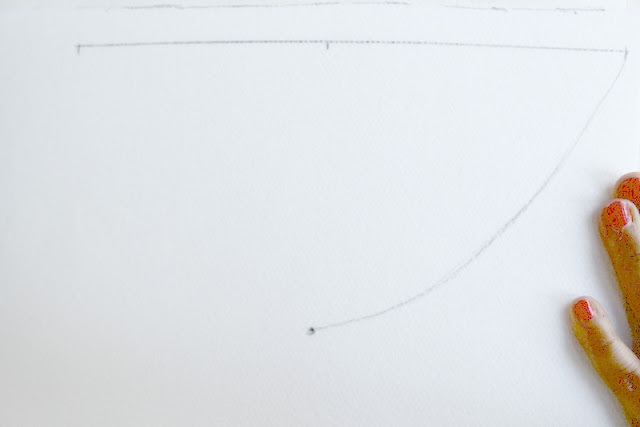 Take the 9x10" piece and line it up along the straight edge of the half circle. You are going to attach it along the three sides where it touches the pieces that are already in place. So you will sew down the 9" side across the 10" bottom and then up the other 9" side. If you find it difficult to sew in the corners just sew all the way down the side and then start again. This is what you should be left with when you turn the piece out. Repeat this step with the remaining half circle and fabric. Now you should have one raw edge around the top. Press the raw edge under 1/4" and top-stitch it into place. Do this with both pieces. Now we are ready to put all the pieces together. You want the outside body of the organizer to be the one that has the interfacing attached to the bottom. So the interfacing should be inside the turned out bag Then shove the other piece into that first piece to create the lined organizer. Once these are in place we are going to shove the two remaining pieces of interfacing into place. Like I said you may have to trim a bit now that all the seams are in place. If you want the curve to be pronounced you will want to wet down the interfacing and lay it over a pot and weigh it down for a few hours so that curve sets. Pin around the curved edge of the top. Then we have one last step before we close the whole thing up. We are going to use our ribbon and D rings. Cut a small 2-3" strip of ribbon. Fold the ribbon in half over the straight edge of the D ring and pin this in place on the straight edge of your organizer. Repeat this step. The D rings should be a few inches from the corners. Top-stitch around the entire top edge of the organizer making sure to catch both sides of fabric and the interfacing to keep it all in place. Now cut another strip of ribbon, this one much longer because it will go around the head rest in the car. Sew it in place on one of the D rings. The other end of this long ribbon will be attached to the swivel hook. Once you have attached all the ribbon you are all set! Your organizer is finished! You might want to make one for each kid! Then let them take it back and forth with their toys or books or whatever else they might keep in the car! My new rule is going to be you can only have as many toys as will fit in the organizer in the car at one time! Wonder how long that will last! Thanks for letting me share this tutorial with you! I would love for you to visit me on social media and see what I have been up to over on Sew What Alicia!